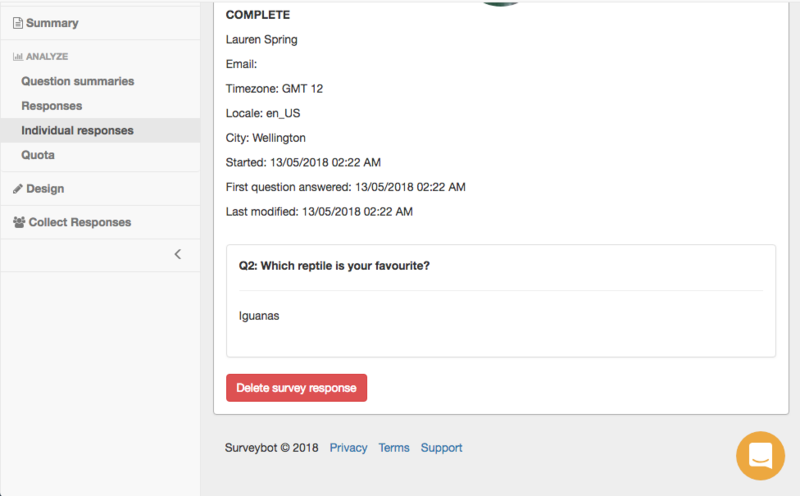 How to delete specific responses from your surveys. If you want to delete an individual response from your survey, click on the specific survey in your surveys tab, then click the 'Analyze' button on the sidebar. Then select the 'Individual responses' tab under 'Analyze' on the sidebar, and this will show you all the responses to your survey. Find the particular response you would like to delete, and press the red 'Delete survey response' at the bottom. It will look much like the image below. If you want to delete all the responses for a certain survey, under the 'Analyze' tab, go to 'Responses'. Then click the 'Delete responses' button in the top bar, circled in red in the below image. This will bring up a dialog box that will ask you to type in the name of your survey to confirm that you want to delete all of the responses to it. Enter the survey name and click 'Delete my responses'. If you have any questions about this or any other matters, please don't hesitate to contact us at support@surveybot.io.